By John F. McKenna (McJack): In the lead up to the fight between then WBC welterweight champion Victor Oriz (29-3-2, 22 KO’s) and new WBC welterweight champ Floyd Mayweather Jr., Golden Boy Promotions CEO Richard Schaefer was openly predicting that the Pay Per View buys for the fight would exceed 1.5 million and might go as high as 1.8 million. In addition “Money” Mayweather continued to boast that he was number one when it came to PPV buys. With the Mayweather – Ortiz fight now five weeks behind us, there still have not been any announcements as to how many PPV sells the fight did. So what gives? Rumors have continued to circulate that Mayweather – Ortiz did approximately 850,000 sells, but at present that is rumor and mere speculation. No one has come out as one would expect to clear the air. One would presume that if the PPV sells had met or exceeded expectations, Schaefer and HBO would not be silent about it, but instead would be trumpeting it to the world. In lieu of any forthcoming announcements regarding the Mayweather-Ortiz PPV buys only one conclusion can be reached. CEO and HBO do not like the results. When Mayweather fought “Golden Boy” Oscar De La Hoya in 2007 it drew in excess of 2.4 million PPV buys, which is an all time record. The event was worth a staggering $137 million dollars in gross sales. That fight demonstrated to everyone that Floyd Mayweather Jr. is a cash cow. That is why Golden Boy Promotions bends over backwards to pacify Floyd and does nothing to alienate him. They want to do everything in their power to keep Floyd happy. The live gate for Mayweather – Ortiz was a disappointing $9 million dollars. That figure was made public because the Nevada Athletic Commission, which is a state agency, requires a full accounting. Live gate receipts and PPV buys are a mirror reflection of each other. If one does well, so does the other. There are a number of reasons why PPV buys are declining. Victor Ortiz, though well known to the boxing public was not a household name to the casual fan. A very large percentage of PPV buys are made in the hours leading up to a fight. Ortiz did not generate the kind of excitement that would make the casual fan want to put down in excess of $50 dollars to watch the fight. That is why promoters keep going back to an over the hill fighter such as Shane Mosley and Juan Manuel Marquez and hype one of their fights as if they have a real chance to win. By the time the HBO 24/7 series covering Manny Pacquiao and Shane Mosley was completed a large percentage of boxing fans thought “Sugar Shane” had a real chance at achieving victory. The same will be true after the Pacquiao – Marquez HBO 24/7 series is completed. There are only so many big name fighters to go around and oftentimes fighters who are past their prime are re-circulated by promoters. In essence even Floyd Mayweather could not make up for not having another big name on the ticket. It remains to be seen what the recent HBO debacles will do to PPV sales. Both the Mayweather – Ortiz and Hopkins – Dawson fights fell far short of living up to the pre fight hype. It will be interesting to see if the PPV buys for the November 12 matchup between Manny Pacquiao and Juan Manuel Marquez reverses the recent trend. 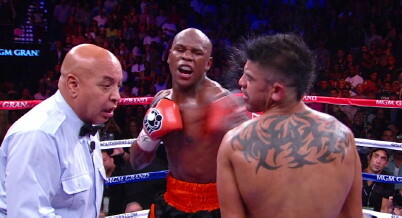 Boxing » Floyd Mayweather Jr » Are declining PPV buys a trend?